This little guy was waiting on me outside the other day. He made me smile. So cute. But I couldn’t get too close. I just wouldn’t. He was precious but those things can jump, did you know? Family lore has it that one evening many years ago (I think it’s been 41), my Mama, who was pregnant with Mess Cat, was taking a shower in our little bathroom at the old house. The bathroom had a window over the shower which they cracked sometimes for ventilation. This particular evening Mama had a guest in the shower. A little green guy just like this one. He was camouflaged by the greenery outside the window until…..
he jumped in on top of Mama. I was thinking about that when I saw this guy for two reasons. Number one, I was not going to put myself in the jump zone. Zoom on the camera works just fine thank you very much. Number two, I wondered at how, despite this frog story, the frog became Mama’s totem. We gave her all kinds of frogs over the years. I even made her a fleece blanket covered in rainbow frogs. And she LOVED IT. I have no idea. Maybe it’s because she was a good sport? And it just caught on? Maybe. Because she was definitely a good sport. It’s funny, isn’t it? The things that just are and you never think to question it. Until one day you do and you find the answers are gone with those you love. Tonight I’m thankful for all those years Mama received our frog gifts and loved them and put them on display or used them and said they made her “very hoppy.” Yeah, not only was she a good sport she was also very punny. Wishing you a day filled with many hoppy moments. Love to all. I understand completely. I found a toad in the sink on our patio a few weeks ago. I screamed and ran without hesitation. 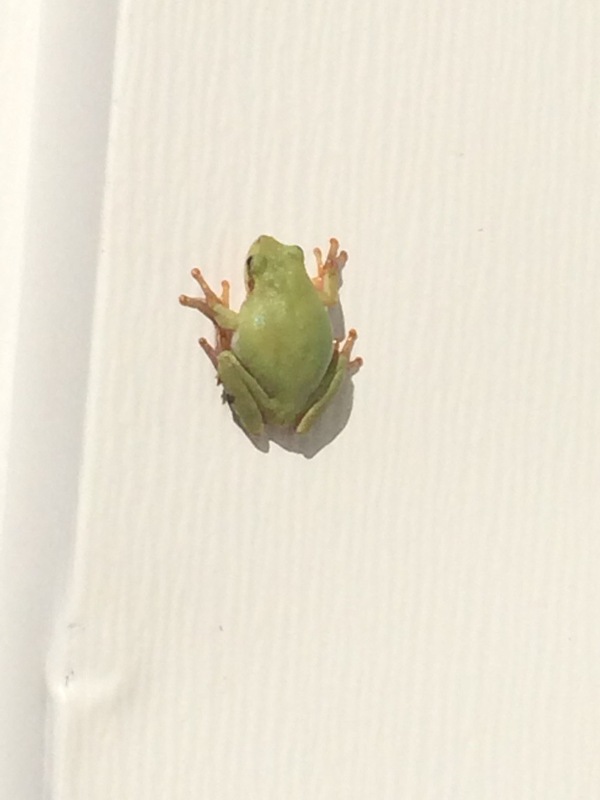 I have an absolutely unreasonable pathological fear of those little green tree frogs – and yes – people love to give them to me! Oh Betsy, I’m afraid you may be stuck with that as your totem. I know Mama must have shaken her head a time or two, wondering if we really loved her or were just trying to make her crazy. (And some of those times had nothing to do with the frog gifts. LOL) Thanks for reading and sharing your story. It is frequently those things that scare us most that have the most to offer. I’m very freaked out by rodents, but have had dreams about them for years. And we have had rodent visitors on our patio off and on for awhile. Not thrilled but I understand that for some reason they show up by my home and in my dreams for a reason. That is fascinating. I wonder what that reason is. I played around with some dream analysis in my Psychology major. So yeah, I’m intrigued. Thank you for sharing that. And I’m no fan of rodents myself. We had one that did a lot of damage before I got him the first year we lived here (we back up to the woods). I started being more proactive then. Every winter I get a little nervous and start watching for signs. May you have rodent free dreams tonight, Heidi!